Learn where to find high rarity gear with this Apex Legends loot tier map and crate locations. 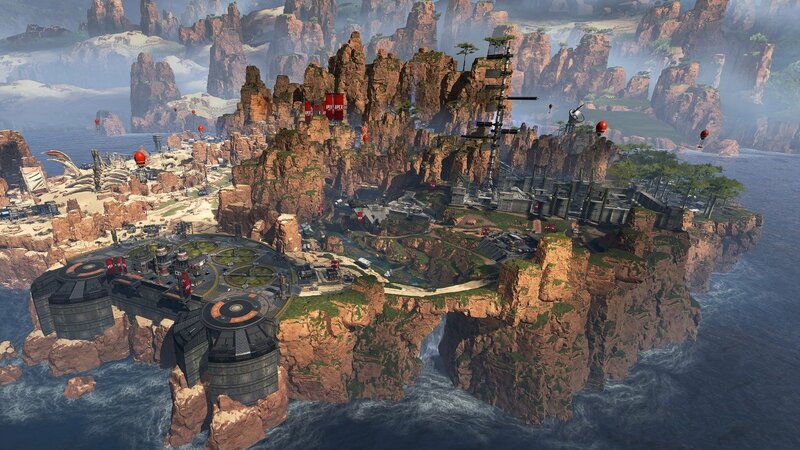 A loot tier map and crate locations should be the first resource for new Apex Legends players. In fact, this kind of gear map is also excellent for those players still learning the ropes. Finding the right place to land to get better gear is going to be critical to your success, so brush up on your geography before you become the Jumpmaster. The following loot tier map is thanks to Reddit user AaronThMi. This map shows the various tier levels of gear as well as the crates. 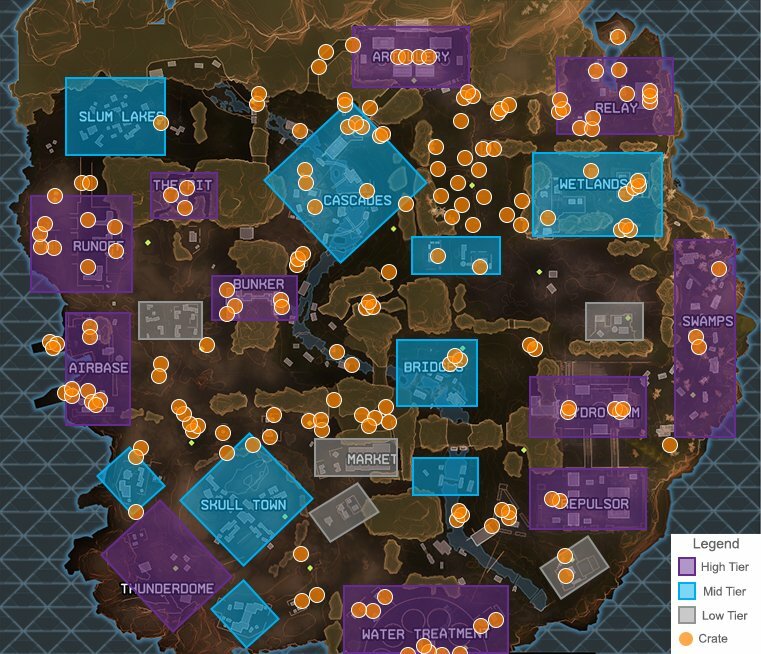 Yellow dots refer to the crates, blue squares indicate rare gear, and purple squares represent areas where epic gear is known to spawn. Though the areas highlighted typically what's displayed in-game, high tier loot can still spawn in low tier areas. As you can tell from this map, areas with multiple points of ingress and egress have fairly middle of the range gear. The reason for this is that these areas offer low risk and are fairly easy to navigate. For these reasons, it can sometimes be a good idea for new players to land in these areas (provided they aren’t the hot zone) as they offer a moment for new players to learn what items look like when on the ground. Meanwhile, purple areas are around the edge of the map, border open areas, and are otherwise high-risk. Landing in a purple area can also be a toss-up, as there’s always the chance the next circle will be on the other side of the map. However, the advantage of a high tier loot location is self-evident. While some locations on the map are known as "rare" or "common" looting sites, it doesn’t mean good gear never spawns there, quite the opposite. There’s every chance that a place like Market, which the map indicates as a fairly low-tier gear spawn point, will hold some epic weapons and consumables. Similarly, an area that doesn’t have a name is one of the best loot locations in the game. This area resides south of Artillery between Cascades and Wetlands. This grassy canyon has numerous crates, each containing a vast array of gear. In saying all this, a loot tier map can only get you so far in Apex Legends. While something like this is useful at the beginning and middle of a career, as you become more familiar with the game, you will form your own preferences about what areas of the map hold high tier loot. Check out our Apex Legends game guides for more helpful resources! I think dropping in high tier zones is kind of overrated. You don't need blue/purple gear to win an early game fight. Just loot the good stuff off of other players later.